The intercompany transactions are a common business practice where companies trading goods between each other. There is company sells the goods, and a company receives the goods. The used documents in Microsoft Dynamics AX are sales order which used in the sender company which sells the goods, and the purchase order which used in Receiver Company which receives the goods. The trading of inter-companies may requires to keep the item cost consistent in the both companies and this requires a specific treatment in Microsoft Dynamics AX operations, and transactions executions. 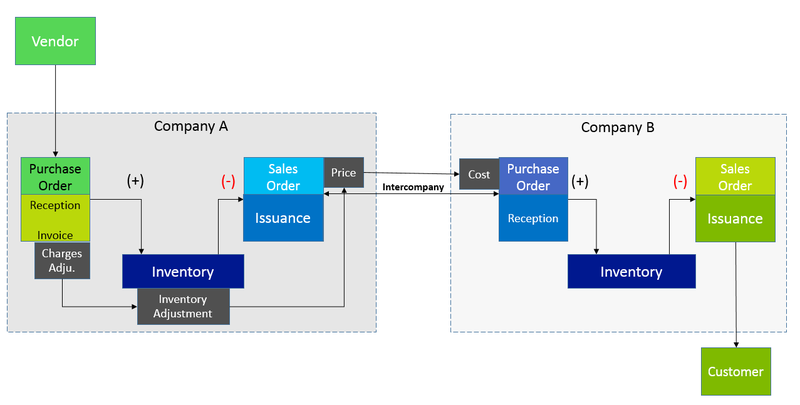 The scenario assume that there are two sister companies; company A represents the company which purchase goods from an external vendor, and these goods are sold to its sister company B, these goods will be sold for an external customer the two sister companies are agreed that the sales and cost price of the intercompany transactions should be equal. Assume that the item cost in company A has changed after issuing the goods to the sister company B, by an extra charges (freight, transportation) and at the end of the month this changes will be reflected on the item cost after running the inventory recalculation/closing. This will be reflected on the intercompany-sales price on company A, and intercompany-purchase cost on company B. In order to simulate this scenario on Microsoft Dynamics AX 2012 R3 we should have the master data, intercompany configurations, setups, and transaction execution. In Microsoft Dynamics AX 2012 R3 client, go to the company which will represent the company which will sell the products (company A in our scenario). Go to Accounts Receivables| Common| Customers| All customers, and create a new customer represents the intercompany customer “company B”. then go to General ribbon| Setup| Intercompany. 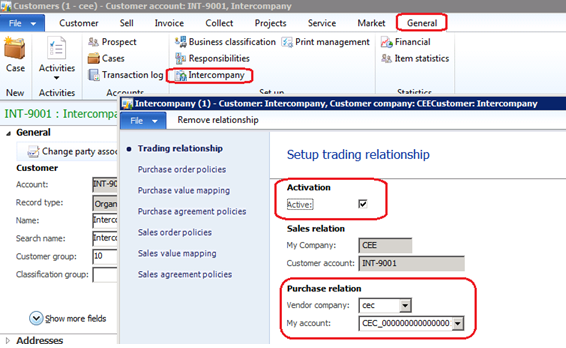 In the Intercompany form mark Activate check box and identify the vendor account in the company B. 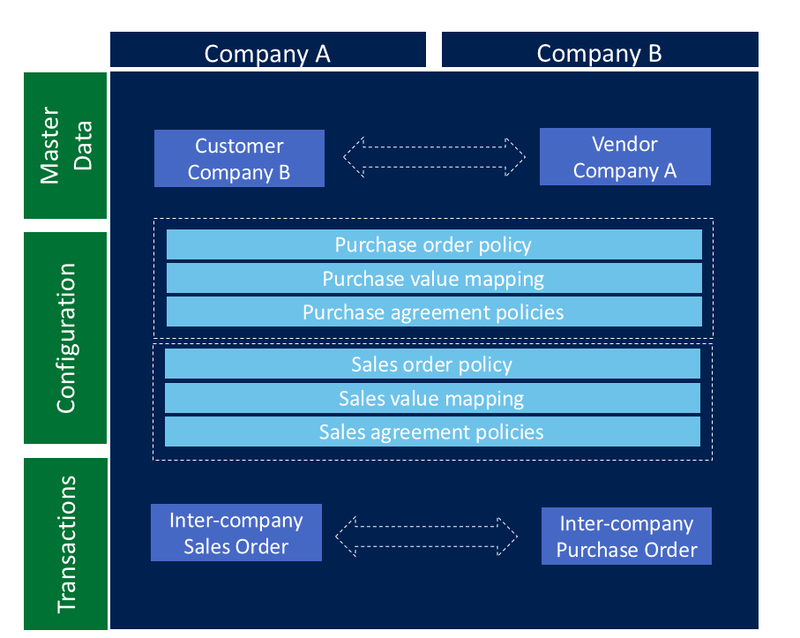 Create an intercompany-sales order in the company A, then Microsoft Dynamics AX will create an intercompany purchase order in company B. The intercompany sales price is item the cost in the inventory, and the intercompany purchase order cost price equal to sales price. At this stage the item cost is changed based on additional charges on company A, and this will be reflected on the intercompany sales order after running the recalculation/closing, then will be reflected on the intercompany purchase order. In case of the intercompany sales order is invoiced the cost changes will not be reflected on intercompany purchase order, neither the intercompany sales order.